Nissan Leaf Interior, Sat Nav, Dashboard | What Car? You sit quite high up in the Leaf, almost as if you were driving an MPV. You’ll either like that or you won’t, but the fact that the steering wheel only moves up and down (not in and out) is a big issue; it means there’s a good chance that you'll be forced to sit closer to, or farther away from, the wheel than you’d ideally like. 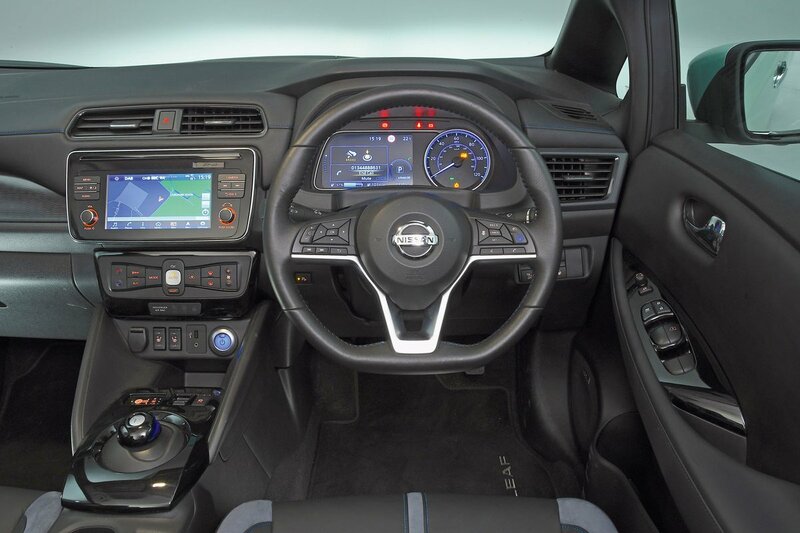 The dashboard is mostly user-friendly, although we do wish Nissan had opted for dials with which to tweak the interior temperature. It’s quicker and easier to just twist your wrist than to stab away at a button. You won’t have many issues seeing out of the front, but the chunky windscreen pillars can really block your view at junctions and roundabouts. Over-the-shoulder visibility could be better, too, but you do get a reversing camera as standard with entry-level Acenta trim. N-Connecta and Tekna trims add an around-view camera that displays a bird’s eye view of the car on the central touchscreen to make parking extra easy. These posher trim levels also come with front and rear parking sensors. 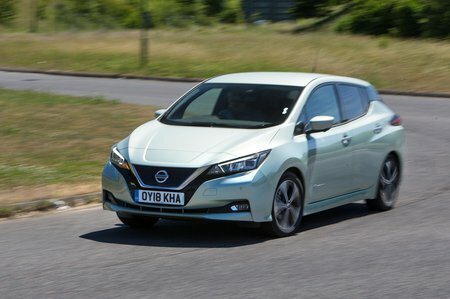 The Leaf’s standard headlights are acceptable but not brilliant, so it’s worth upgrading to the more powerful LED units if you can. These are a reasonably priced option on N-Connecta trim and come as standard on the range-topping Tekna. Every Leaf comes with a 7.0in touchscreen that’s reasonably simple to use, thanks to a logical operating system. The physical shortcut buttons that flank the display make it easy to hop between functions, and we’re grateful that Nissan hasn’t bowed to the latest trend and swapped the volume knob for a fiddly touch-sensitive pad. Less impressive is the resolution of the touchscreen; it is nowhere near as sharp as a VW e-Golf’s or even a Kia e-Niro's, and it can be tricky to see in bright, sunny conditions. All trim levels come with sat-nav, a DAB radio and Apple CarPlay and Android Auto smartphone mirroring. Only the range-topping Tekna gets a Bose stereo, although the sound quality delivered by this isn’t as amazing as you might imagine. 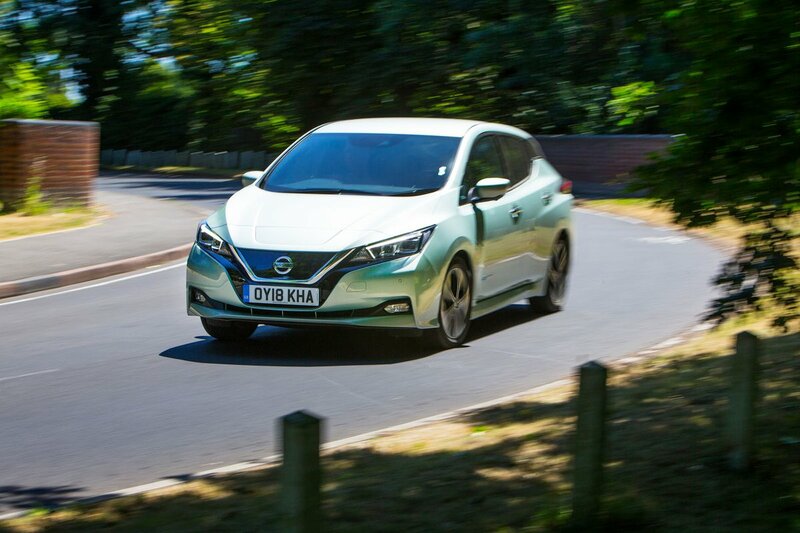 ‘Par for the course’ is probably the best way to sum up the quality of the Leaf’s interior. It’s smarter than a Renault Zoe’s, with more appealing textured dashboard plastics that feel more solidly screwed together. However, it’s nowhere near as classy as the interior in an e-Niro or e-Golf. The Leaf’s dashboard materials simply aren't as dense-feeling or pleasingly squidgy to the touch, and the buttons and switches seem a little more flimsy.